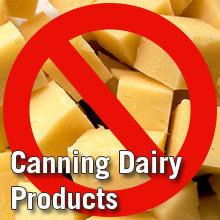 Despite what is found on the internet, there are no science-based methods for home canning of cheeses, milk, butter or other dairy products. Clemson Extension and the National Center for Home Food Preservation do not recommend any process for canning these products. Two examples are discussed in the following paragraphs. Cheese: A Youtube video indicates that all kinds of cheeses including cream cheeses may be canned. The video demonstrates canning Cheddar cheese and cream cheese. The cheese is cut into cubes or slices, placed in hot jars and melted in a 200F oven. The jars are closed with two-piece canning lids and processed for 20 minutes in a boiling water bath. The resulting product is claimed to be shelf-stable. Butter: There are some directions for “canning” butter on the Internet. Most are not really canning; no boiling water or pressure canning processes are applied to the filled jar. Jars are preheated, the butter is melted down and poured into the jars, and the lids are put on the jars. Some directions say to put the jars in the refrigerator as they re-harden, but to keep shaking them at regular intervals to keep the separating butter mixed as it hardens. This process is merely storing butter in canning jars, not canning. True home canning is when the food is heated enough to destroy all spores of Clostridium botulinum or when it is sufficiently acid and is heated enough to prevent growth of those spores and spoilage-causing bacteria during room temperature storage on the shelf. When you consider the economics of the process (energy costs involved with heating, cost of jars and lids, etc. ), even if the butter is bought on sale, it may not be economical to prepare butter to store for years in this manner. Good quality butter is readily available at all times, if butter is needed for fresh use. If the concern is about emergency food supplies, there are dry forms of butter that can be purchased and stored, oils that can be used in an emergency, or commercially canned butter in tins (although only for sale from other countries). Melted and re-hardened butter may not function the same as original butter in many types of baking. Physical safety and food quality: In the provided directions, the jars are preheated in an oven (dry-heat), a practice not recommended for canning jars. Manufacturers of canning jars do not recommend baking or oven canning in the jars. The practice may cause jar breakage. Jars heated in this dry manner may not be sufficiently heated to sterilize them; we do not have data on sterilizing jar surfaces by this dry-heating method. The butter is not really being 'canned'; it is simply being melted and put in canning jars, and covered with lids. Due to the heat from the hot melted butters and preheated jars, some vacuum is pulled on the lids to develop a seal. It rarely is as strong a vacuum as in jars sealed through heat processing. The practice in these 'canned' butter directions is referred to as 'open-kettle' canning in our terminology, which is really no canning at all, since the jar (with product in it) is not being heat processed before storage. Although mostly fat, butter is a low-acid food. Butter, milk and cream (like meat and vegetables) are low-acid products that will support the outgrowth of C. botulinum and toxin formation in a sealed jar at room temperature. Low-acid products have to be pressure-canned by tested processes to be kept in a sealed jar at room temperature. It is not clear what the botulism risk is from such a high-fat product, but to store a low-acid moist food in a sealed jar at room temperature requires processing to destroy spores. A normal salted butter contains 16 to 17% water, some salt, protein, vitamins and minerals. Butter-like spreads contain varying amounts of water. We have no database in the home canning/food processing arena on the microbiological concerns for butter stored at room temperature in a sealed jar. Without that information, given that butter is low-acid and that fats can protect spores from heat during a canning process, we cannot recommend storing butter produced by these methods under vacuum-sealed conditions at room temperature. Some other directions do call for “canning” filled jars of butter in a dry oven. This process also is not “canning”. There is no research-based documentation that shows that “canning” any food in a dry oven is sufficient heating to destroy bacteria of concern or to produce a proper seal with today's home canning lids.